USDA Grade A. Cage free. Vegetarian feed contains no added antibiotics, hormones (No hormones are used in the production of shell eggs), animal fat, or animal by-products. Good source of vitamin D (see nutritional information for cholesterol content). Where simple goodness begins. 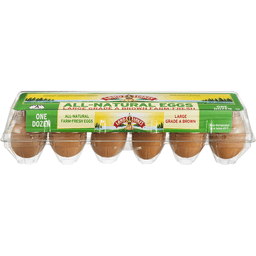 Land O Lakes cage free brown eggs are produced by hens fed a simple vegetarian diet that contains no hormones (No hormones are used in the production of shell eggs), steroids, antibiotics or animal by-products. All eggs are graded and approved for quality and freshness and packed in clear cartons that are made of 100% recycled PETE plastic. It's the kind of commitment to quality and simplicity you don't see everywhere, and it produces eggs so fresh and delicious, they make ordinary eggs pale in comparison. American culinary federation. Seal of approval. But don't just take our word for it. 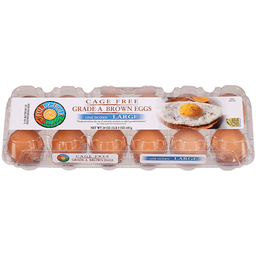 The American culinary federation recently awarded land o lakes cage free brown eggs their gold seal of approval based on triple blind testing by their panel of impartial professional chefs. Questions or comments, call 1-800-328-4155 or visit. www.landolakes.com.